C.Jane.Do: Attic Sales are fun, but Jazz in the park rocks! Hello! Here begins my promised post from the list of what is soon to come! So, last Friday I went with some co-workers to check out a local 'attic' sale. These are great for if you are like me and you love garage sales, but don't want to go through the arduous process of trekking all over town finding the ones that actually have things you are looking for. My friends and I had a great afternoon looking through things and hanging out, but Saturday was exceptionally great. 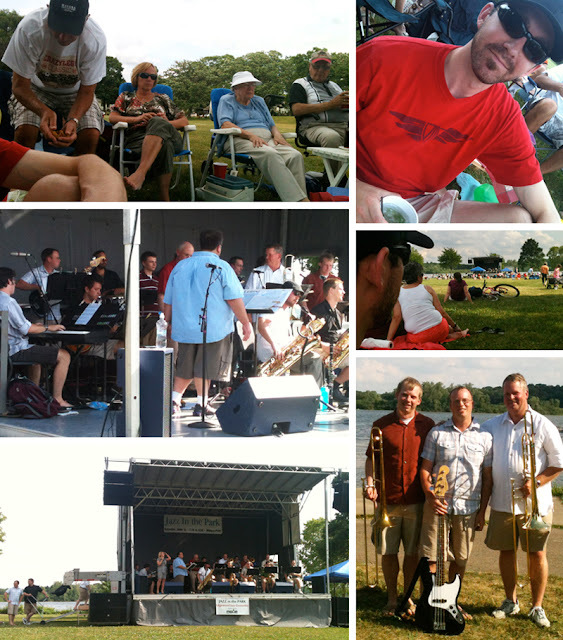 My family annually attends the local Jazz-fest held at Wingra Park downtown Madison. Mostly because my Uncle and Cousins always participate in the Edgewood Jazz band, but also because it's such an amazing setting to listen to live jazz music. The day turned out to be more than perfect and the crowd was the largest that I believe we've ever had! It helps with the good weather, but it's so nice to also get to people watch. Madison sure brings out some characters with the nice weather. Along with the music we enjoyed snacks and beverages. Chad and I packed up a cooler and hiked the 1.5 miles from my house. My claim-to-fame were the mojitos that we brought. I've been looking for something to do with all this mint that I seem to be growing, so my cousin, Kevin and Chad promised they would bar-tend if I brought 'the stuff'. I am not a fan of Mojitos because of the sweetness, but they promised I would love them - and they were right! Here is a photo collage of the day. Thanks for reading! Bottom-right: Kevin, Brian, and Unkie Dunkie, or Uncle Dave. Ask Jeff G from accounting about the sale--he was there at 6:30am! He has some great stories. As far as mojitos go...I can show you the jolly bob's recipe! Definitely the thing to do with all that mint! Oh yeah! I'll definitely have to hear these stories that Jeff has. Should we go at 6:30 next year?? ?